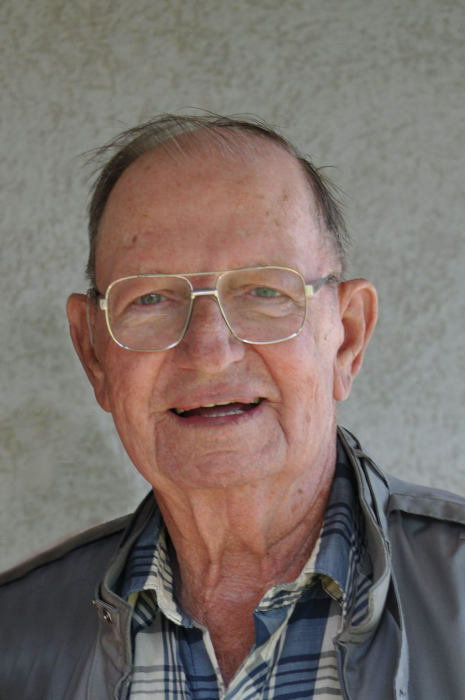 Boise City, Oklahoma – Duane Ferguson, 84, longtime area farmer and business owner, passed away Tuesday morning, January 15, 2019 at Coldwater Manor in Stratford, Texas. The son of Gladys (Roberts) and Harold E. Ferguson, Harold Duane Ferguson was born April 27, 1934 in Chicago, Illinois. As a young boy, he spent many summers on the Roberts family farm in the Eva/Yarborough Community. After graduating from Calumet High School, Chicago, in 1952, Duane loaded his car and moved, for good, to the Oklahoma Panhandle. To quote the article where he was honored as the 2007 Cimarron County Hall of Fame Inductee, “Duane Ferguson wasn’t born in Cimarron County, but he got here as fast as he could.” He worked on the farm and attended Panhandle A&M College, Goodwell, Oklahoma, graduating in 1959 with a Bachelor’s of Science. Duane met this beautiful waitress with a truck load of kids and he was never the same. Waunita and Duane were married December 28, 1967 in Elkhart, Kansas. With this union, they formed their united family with eleven children. Duane and Waunita worked hard and enjoyed their family and their community. They worked in the family business, Ferguson Plumbing, while Duane farmed as well. They enjoyed camping, family cookouts, and taking family trips to the mountains. Duane, particularly loved his ice cream and dark chocolate, sharing many sweets with his grandkids and great grandkids. By the grace of a loving and forgiving God, Duane was blessed with 45 years of sobriety. Duane and Waunita were integral in starting Camp Billy Joe AA Camp which still continues today. He served as Boise City mayor, a member of Cimarron County Chamber of Commerce, a member of Camp Bill Joe Board of Directors, on the board of Next Step Treatment Center in Guymon, a long-time member of the Lutheran Church, where he still has many friends, and was a current member of St. Paul’s United Methodist Church. He and many friends were responsible for the Christmas lights downtown, decorated the caboose, and Duane loved to play Santa Claus. Duane felt he owed so much to the people of Boise City and the Panhandle. They gave him his beautiful family, work to do, neighbors to help and love and support over the years. Duane is preceded in death by his sweetheart, wife of almost 46 years, Wuanita Ferguson, who passed away November 13, 2013; one daughter, Verna Derrick, four sons, Donald Schwindt, Daryl Schwindt, Delane Schwindt and Brett Schwindt. He was also preceded in death by four grandchildren and two great grandchildren. Duane is survived by his seven children, Gerry Schwindt of Boise City; Debra Kress (Randy) of Bethany, OK; Denise Geist (Rick) of Seminole, OK; Darla Knuth (Todd) of Fargo, ND; Kyle Schwindt of Boise City; Gary Schwindt (Zona) of Boise City; Kim Mizer (Billy Ray) of Boise City; his sister, Donita Hayes of Elkhart, KS and her childen: Kyle, Gay, and Carla. He was Grandpa to his twenty-seven grandkids, Shannon Derrick, Justin, Dustin, Crystal, Jhordan, Jeremy, Joshua, Jessie, Jennifer and Jared Schwindt, Chad Alvarez, Brandy Stewart, Michael and Michelle Edmondson, Mindy Newman, Nathan and Brian Geist, Heath and Morgan Knuth, Victoria Westbrook, Dondey Williams, Christy Flick, Makenzie Walshak, Bridgett and Autumn Mizer, Kassidy Rosas and Kayla Hibbert; thirty-seven great grandchildren and five great-great grandchildren, and numerous extended family, relatives, and family. Visitation will be Thursday evening, January 17th, 6:00-8:00 PM at the Henson-Novak Funeral Directors, 700 West Main Street, Boise City. Funeral services will be Friday morning, January 18th, 10:30 AM at St. Paul's United Methodist Church, Boise City, with Rev. Randy Little, pastor, officiating. Interment will follow in Boise City Cemetery. Memorials may be given to Camp Billy Joe or St. Paul's UMC, c/o Henson-Novak Funeral Directors, P.O. Box 1306, Guymon, OK 73942. Friends may sign the online guest book and send condolences at www.hensonnovak.com.